Cerebral autosomal recessive arteriopathy with subcortical infarcts and leukoencephalopathy (CARASIL) is also known as familial young-adult-onset arteriosclerotic leukoencephalopathy with alopecia and lumbago without arterial hypertension, or Maeda syndrome  or Nemoto disease. CARASIL is caused by homozygous or compound heterozygous single gene mutation in the HTRA1 gene on the long arm of chromosome 10 (10q26). CARASIL was reported by Maeda et al., in 1976 in two Japanese brothers who had rigidity, spastic ataxia, and dementia. Since then, the disease has been reported in approximately 50 patients worldwide with the majority of patients being from Japan and China. A few cases have been reported from Europe, Turkey, India, and have also been seen in the Caucasian population  [Table 1]. 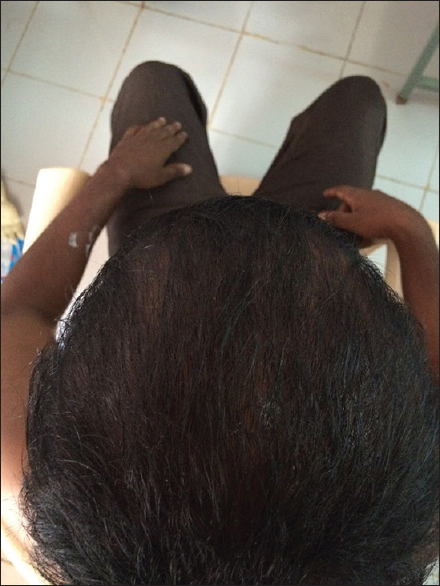 A 27-year old nonhypertensive and nondiabetic male from rural Karnataka, India, presented with a history of gait disturbance caused by progressive right-sided hemiparesis of 15-year duration; behavioral abnormalities with features such as excessive talking, easy irritability, and aggressive behaviour suggestive of schizoaffective disorder of 10-year duration which had relapsed; neck and back pain of 10-year duration; and, episodes of generalised tonic clonic seizures (GTCS) of 1.5-year duration. He was on tab carbamazepine 300mg 1-0-1, tab clobazam 10mg 0-0-1, tab lithium 300mg 1-0-1, tab risperidone 3mg 0-0-1, and tab trihexyphenidine 2mg 1-0-0; however, compliance to medication was reported as being poor. He was also diagnosed to be having pulmonary tuberculosis 1 year prior to presentation, which was treated by a local physician. He was the fourth child, born out of second-degree consanguineous marriage. The first sibling had a history of seizures, chronic cough with expectoration, and excessive sweating, and died at the age of 3 years. The second sibling was 34-years old, with no history of neurological abnormalities. The third sibling had a history of excessive sweating and cough with expectoration and died at the age of 5 months. 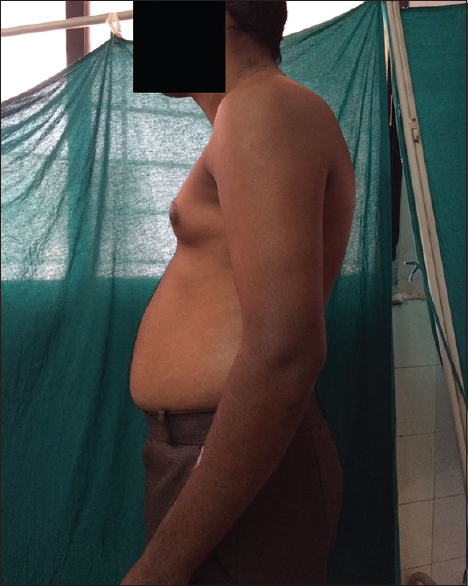 On examination, the patient had a normal blood pressure, alopecia [Figure 1], skeletal abnormality in the form of mild kyphoscoliosis [Figure 2], and multiple swellings over the back. Neurologically, the patient had cognitive impairment, pseudobulbar palsy, and bipyramidal signs. Blood investigations revealed a normal hemogram and also normal blood biochemistry values. Fine-needle aspiration cytology (FNAC) of swellings on his back was suggestive of the presence of lipomas. 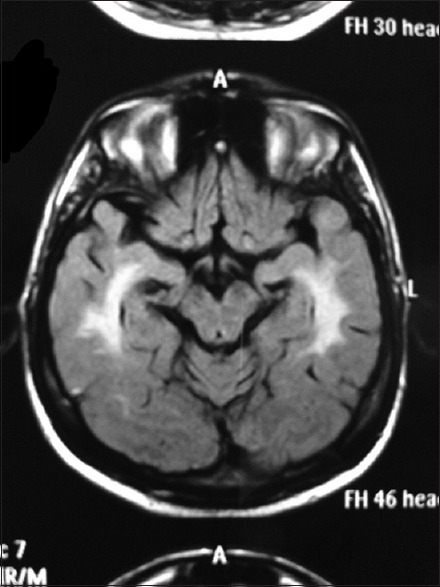 Magnetic resonance imaging (MRI) of the brain showed bilateral symmetrical periventricular white matter T2 fluid-attenuated inversion recovery (FLAIR) hyperintensities with relative sparing of the subcortical U-fibers [Figure 3] and involvement of the corpus callosum and external capsule [Figure 4], as well as bilateral temporal lobe white matter [Figure 5]. Multifocal T2 and FLAIR hyperintensities involved the midbrain and pons. There was diffuse cerebral atrophy. 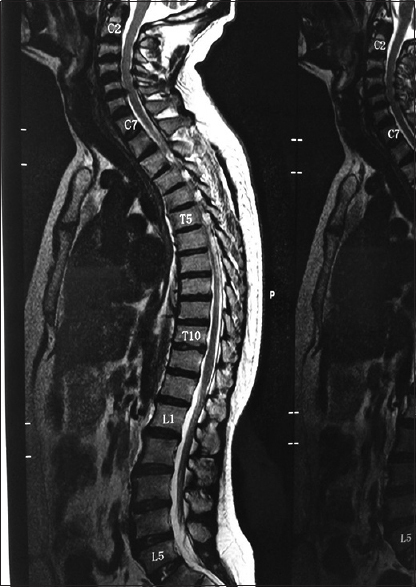 MRI of the spine showed cervical and lumbar spondylotic changes [Figure 6]. 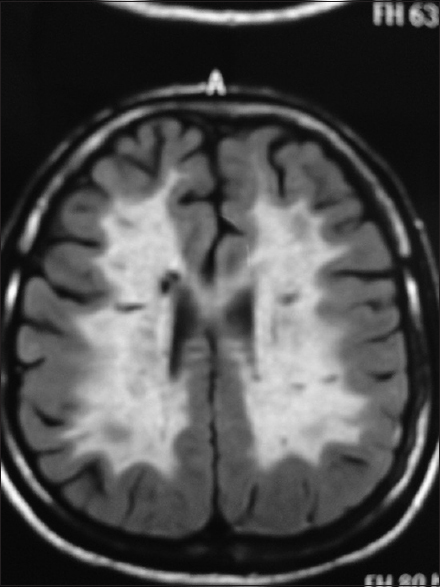 As the patient presented with stroke at a young age, was normotensive, had spinal abnormalities, an early-onsetalopecia, a history of consanguineous marriage in parents and an early death of siblings, an autosomal recessive pattern of the disease was suggested. This presentation along with the neuroimaging findings and behavioral changes that the patient had led to the diagnosis of CARASIL in this patient. However, due to lack of finances, genetic testing could not be performed. 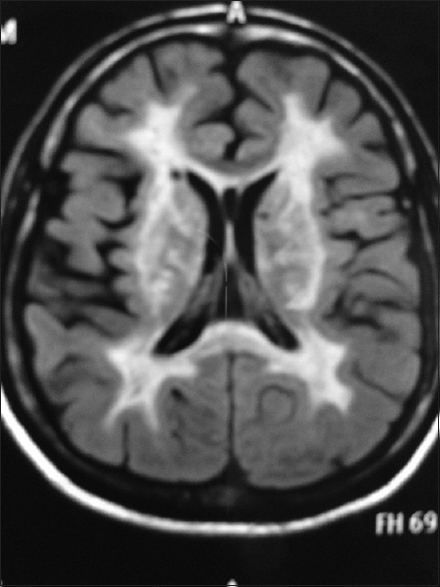 Other inherited disorders that cause leukoaraiosis in young patients in adulthood such as CADASIL (cerebral autosomal dominant arteriopathy with subcortical infarcts and leucoencephalopathy), HERNS (hereditary endotheliopathy with retinopathy, nephropathy, and stroke), and Fabry's disease were excluded by the absence of their respective clinical signs, MRI findings, mode of inheritance, and appropriate laboratory investigations. The patient's antiepileptic medication was switched to tab sodium valproate 500 mg 1-0-1 as it served to be a mood stabilizer as well. Tab trifluoperazine 5 mg and trihexyphenidyl 2 mg 1-0-1 were prescribed for his schizoaffective symptoms; tab pregabalin 75 mg 1-0-1 and tab etoricoxib 90 mg were given for his radicular pain, and a cervical collar was also advised. Lifestyle changes were explained and family members were counselled regarding the inheritability of the disease. After the patient's behavioral symptoms remitted, he was discharged and followed up on outpatient basis. Young adults of age less than 50 years comprise 10% of the overall patients who suffer from stroke. Although single gene disorders account for approximately 1% of ischemic stroke, studies report that the mortality was seven-fold higher in young adult patients who manifest with the onset of stroke, in comparison to the expected mortality in the general population. CARASIL is inherited as an autosomal recessive disease. It is characterized by early-onset changes in the deep white matter. The most common symptom manifesting between the age group of 20 and 30 years is gait disturbance caused by spasticity. Mid or lower back pain of acute onset manifesting from the age of 10 years to up to 40 years, and alopecia of the scalp starting before the age of 30 years are characteristic of CARASIL in the background of neurological abnormalities. Behavioral and mood changes such as easy irritability and apathy, as seen in the present case, manifest between the ages of 20 and 50 years. Pseudobulbar palsy and decline in cognitive functions can occur during this phase. Among affected individuals, 23% develop stroke before the age of 40 years. After the onset of neurological symptoms, the disease progresses slowly over 5 to 20 years. The patient gradually loses emotional stability. Supportive care, including emotional support and education regarding the disease, is the mainstay of management both for the patient and their families. Providing a walking aid to compensate for the gait disturbance along with medication for spasticity are also recommended. Mood stabilizers or other medication for psychiatric manifestations are suggested. Dementia can be managed according to the patient's condition. We report this case of CARASIL to increase awareness about this inherited cause of stroke in young patients. As each sibling of the proband has a 25% chance of being affected, carrier testing for at-risk family members, and prenatal testing for pregnant relatives, should be carried out when indicated. Arima K, Yanagawa S, Ito N, Ikeda S. Cerebral arterial pathology of CADASIL and CARASIL (Maeda syndrome). Neuropathology 2003;23:327-34. Bianchi S, Di Palma C, Gallus GN, Taglia I, Poggiani A, Rosini F, et al. 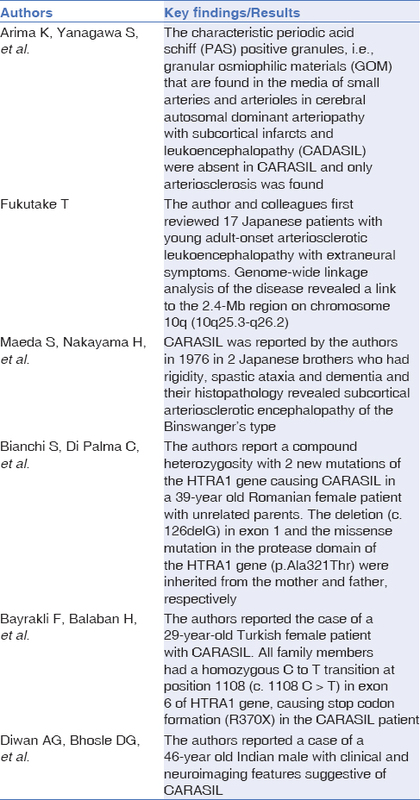 Two novel HTRA1 mutations in a European CARASIL patient. Neurology 2014;82:898-900. Diwan AG, Bhosle DG, Vikram A, Biniwale A, Chaudhary S, Patodiya B. CARASIL. J Assoc Physicians India 2012;60:59-61. Mendioroz M, Fernandez-Cadenas I, Del Rio-Espinola A, Rovira A, Sole E, Fernandez-Figueras MT, et al. A missense HTRA1 mutation expands CARASIL syndrome to the Caucasian population. Neurology 2010;75:2033-5.